Our window for dinner seems to be getting smaller. My husband is home from work by 7 p.m. and the baby would like to be asleep by 8:30 p.m. 9 p.m. at the latest. Add in our pre-bedtime walk and bath - and that's a packed hour and a half. So the new challenge for me is to be able to either have dinners that take 10 mins to prepare or start cooking before the hubby gets home. Here's my ideas for this week. We'll see if they work for our schedule. Have a good week! 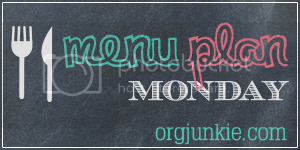 More plans at Orgjunkie! Nice menu. The taquito salad sounds interesting! Have a nice weekk. Yes Adrianne, major foodies! Thanks!